Beethoven wrote five concertos for piano and orchestra. It doesn’t sound like much; his near-contemporary Mozart composed 27. But although it may be a bit smaller, Beethoven’s contribution is a true monument in the history of music. He used the first two concertos to move away from his example, Mozart (whose last piano concerto was from 1791, while Beethoven completed his first in 1795); in Concerto no. 3 Beethoven carved out new dimensions for the genre’s dramatic possibilities. And Concertos nos 4 and 5 have proved to be unmatched in their genre: the radiant Concerto no. 4 is worshipped by experts and aficionados alike, while no. 5 is the all-time favourite of the public at large. Almost 25 years passed between Beethoven’s first sketches for a piano concerto and the double line he drew under his last one. His piano concertos thus show a development covering more than half of the composer’s life. This CD brings the last two concertos together. When you hear them, you cannot help but find it unfortunate that his Piano Concerto no. 6 (in D major, 1815) never got beyond the sketch stage. The solo concerto is absent in Beethoven’s final creative period. But if you are still hungry for more, more is to be found: there is a quite pleasant piano concerto composed when he was fourteen, and when his magnificent Violin Concerto was not appreciated by his contemporaries, he turned it into a piece for piano and orchestra. Once he had accepted the fact that he was inevitably going completely deaf, Beethoven wrote in his moving “Heiligenstädter Testament” (1802): “As the leaves of autumn fall and are withered, so hope has been blighted. Even the high courage, which often inspired me in the beautiful days of summer, has disappeared. Oh Providence, grant me but at least one day of pure joy!” Did Providence grant him that one day? It is hard to say. When it came to happiness, Beethoven had no-one but himself to rely on, as the further tragic course of his life shows. The only thing he had that could counter the forces of fate was his music. And in the first years after he had accepted his fate, his music was a source of huge joy to him. It emanates an optimism that is as beneficent as it is powerful. Take Piano Concerto no. 4, written in 1806: here we become aware of a sort of latent energy, music articulated in rays of sunlight, the deeply effusive light of the month of September. The start is revolutionary. Completely alone, the piano posits its theme – which is highly unusual – and then the orchestra immediately follows suit. It is as if Beethoven first shows us the piano sketch, and then goes on to let us discover how this theme can grow, recede and grow again, taking on more and more meaning. This also allows him to compose a lengthy orchestral introduction without making the impression that he has forgotten the soloist (his Piano Concerto no. 3 opens with such an enormous orchestral exposition that the solo instrument has to wait a long time for its turn...). In the Andante Beethoven quite summarily allows the soloist and the orchestra to converse. The rebellious strings are gently soothed and calmed by the pianist. And quite successfully: the orchestral sentences gradually become shorter, only to merge with the conciliatory pleas of the piano. (Franz Liszt likened this dialogue to Orpheus pleading with the Furies.) Just before the strings yield, the soloist puts forth some moving chromatics and a hair-raising trill. This is followed by the Rondo: expressing a zest for life with simple ingredients tossed in: repeated notes, broken triads, dashes of rhythm. But so very effective! This absolute masterpiece premiered on 22 December 1808 in the Theater an der Wien. It was a concert never to be forgotten. And it was truly gigantic, because in addition to this piece, Symphonies nos 5 and 6, the Choral Fantasy, the aria Ah! Perfido and two parts of the Mass in C Major were also premiered. Simply too much beauty. The audience, in an unheated hall – it was an icy December evening – had to digest four hours’ worth of new music. The playing was not up to par: second-rate musicians, too little rehearsal time and Beethoven himself, nearly deaf, was not in form, to put it mildly. Some of the audience, such as composer J.F. Reichardt, even wished “that they had dared to leave the hall earlier”. Beethoven’s Piano Concerto no. 5 is called the “Emperor Concerto”. It was not given this name by Beethoven, and it makes an incorrect impression. The piece was not dedicated to an emperor, it was not commissioned by an emperor, and it is not about an emperor. Based on the preferences of both the public and the composer, you might call it the crown on his piano concertos and so – although still very much the first among equals – the emperor among the concertos, but then we risk clashing swords with the ‘true’ experts who would choose no. 4. In 1809, the year that he wrote his Piano Concerto no. 5, Beethoven did not have much time for emperors. He lived in Vienna, which was occupied by the armies of the Emperor Napoleon. Heavy cannon fire had caused much destruction; entire families had been reduced to beggary. Beethoven’s house was next to the city walls and when Napoleon issued the order to demolish the wall, his house was left quite unprotected. On the very day that the explosives were positioned, a French officer who admired Beethoven’s music sought out the composer when out delivering a message. Unfortunately, the Frenchman was in uniform. “Do I have the honour of speaking with monsieur Beethoven?” he asked. “Yes, sir! But I must tell you that I know very little French”, Beethoven replied drily. Not much later, once the shelling of the city had started, he was obliged to move in with his brother Johann. There, in the basement, he waited with pillows over his head until the guns had stopped booming. But meanwhile. When you are Beethoven, you persevere. Some hear in Piano Concerto no. 5 Beethoven’s response to the suffering of war and the rising tide of Napoleonic victories. But Beethoven certainly does not sit back and watch; this work was not written from the point of view of a victim. When it premiered on 28 November 1811, not in Vienna but in the Gewandhaus in Leipzig, it was immediately very well received on account of its martial character and the huge strength it emanates. The concerto opens with a clear statement: a powerful chord produced by the orchestra – the masses – is immediately answered by vast arpeggios from the single piano. Twice the orchestra repeats its contention, and only then gives its permission to the piano to launch the main theme. Like two soldiers, the first and third movements carry the stretcher of the Adagio, which bears an injured combatant. This is how Beethoven wrote his Piano Concerto no. 5, this unyielding music that he dedicated to his patron and faithful friend, Archduke Rudolf (perhaps it should even be called the “Archduke Concerto”), a work that guns can never destroy. "[''].. Pianist Minnaar shines in an angular Beethoven."" ""Beginning a Beethoven cycle with the Fourth and Fifth Concertos is a bold move but one that pays off in all sorts of ways."" 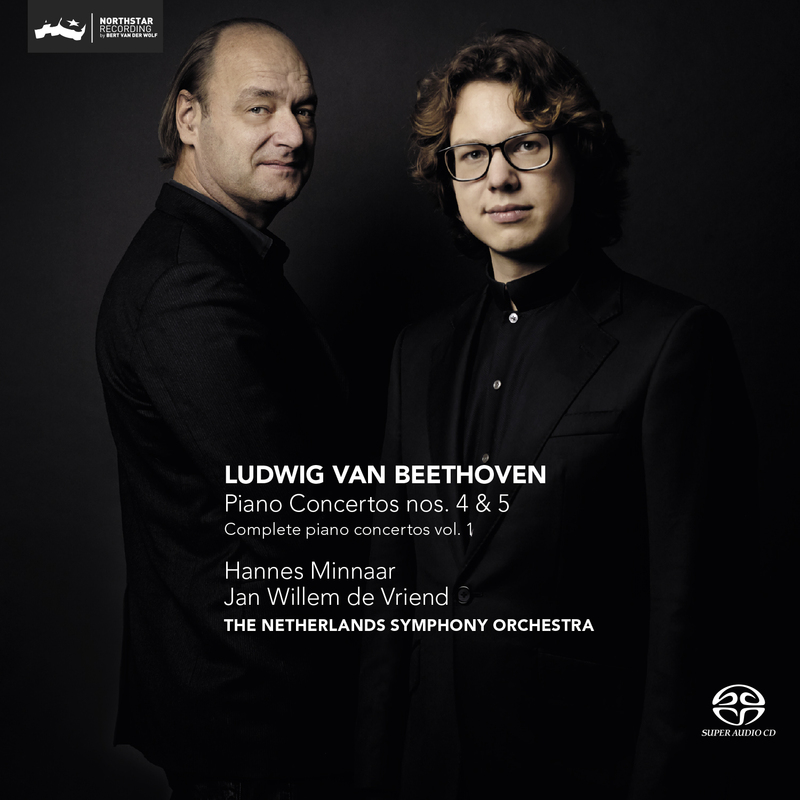 ""Hannes Minnaar exactly knows what is important: the mixture of lyrical moments, that are sensitively tared, and the radical, for Beethoven typical outbursts that need powerfull approach." ""Minaar plays beautifully, with a warm, embracing rone, and De Vriend accompanies energetic." "
""Jan Willem de Vriend has developed into a strong brand. With one of enthusiasm vibrating tongue saves the managing violinist itself through life." "
""The adrenalin level rises to a great height, especially in the cadences." "
""Characteristic to this cd-recording is the non-equal temperament, which gives each key its own character." ""Extremely vivid mix of sounds""
""Pointed, dynamic and sometimes almost stumbling of enthusiasm.""